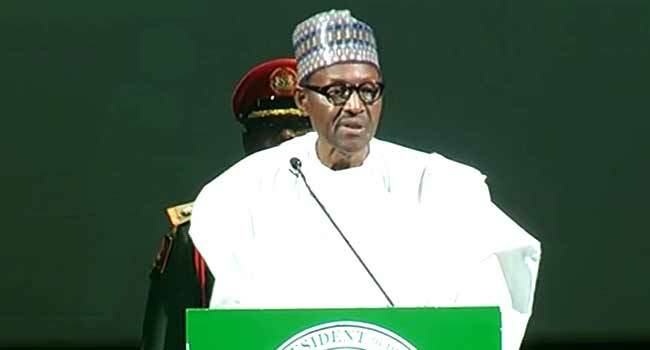 President Buhari says the Federal Government is committed to uniting the people of the country such that every Nigerian can benefit from the other. The President said this on Thursday while giving a speech at a colloquium organised to mark the birthday of the National Leader of the All Progressives Congress (APC), Bola Tinubu, in Lagos. He said although the country and its people are faced with challenges, the government is seeking to improve the ways and means of the collective existence of Nigerians. The President stressed further that his administration hopes to construct a nation where leaders no longer rule by will but according to the law for the betterment of the people. “We seek to replace corruption with correctness, insecurity with safety and poverty with prosperity. The road we thread is rough and hard in spots; the search for progress and reforms has its rough patches. “Many will fight you and connive to deter the march towards a better land, but that march is inevitable. There is no mortal hand that can keep us from our best destiny unless that hand be our own,” he said. President Buhari explained that the government is investing in people so that “tomorrow will be better than today and that good will triumph over evil”. He also revealed that government seeks to rebuild what has been “wrongfully constructed” and to plant a firm foundation for progress where nothing now exists. To accomplish the historic mission of his administration, the President emphasised the importance of investing in people, noting that the expenditures made by his administration constitute the investment in and for the people. He, however, said government depends on the people to govern while highlighting the investment in critical areas of Social Investment Programme and School Feeding Programme among others. President Buhari further lauded the ‘massive investment’ in agriculture which he said has created employment for more than half of the total population of the country. He also congratulated Tinubu on his 66th birthday and commended his contributions to the progress of the nation and Africa at large.